A mummy is a dead body whose skin and dried flesh have been preserved over an extended time period. This may be accomplished by either intentional or accidental exposure to chemicals, extreme cold, very low humidity, or lack of air when bodies are submerged in bogs. Taken from the medieval Latin word “mumia,” this process was practiced in ancient Egypt upon the higher ranked populous. Other cultures have also been known to practice mummification, and a number of examples exist from a variety of locations and time periods. The findings of mummies from different cultures and time periods has been of great value to science, providing a source of information about the health and lifestyles of the various peoples. Their existence, and the continuing interest in the process of mummification or modern equivalents, also provides interesting insights into beliefs regarding death and what comes after it. Some, like the ancient Egyptians, believe in an eternal soul that still needs the body to continue its existence in connection with the earthly plane, fearing that it will wander lost without it. For others, there is the hope of some kind of return to life, or physical resurrection. Others yet seem to have desired a continuing presence on the earth to influence the living. For those who believe that the soul exists on a different plane in the afterlife, no longer needing its physical body, mummification is merely a curiosity. According to etymology, the English word mummy is derived from medieval Latin mumia, a borrowing of the Arabic word mūmiyyah (مومية), which means "bitumen." (Because of the blackened skin of unwrapped mummies, bitumen was once thought to be used extensively in ancient Egyptian embalming procedures. Asphalt and tar are forms of bitumen.) The Arabic word was itself borrowed from the Persian word mūmiya, meaning "bitumen"; this is also related to another Persian word, mūm, which means "wax." The best-known mummies are those that have been deliberately embalmed with the specific purpose of preservation, particularly those in ancient Egypt. There, not only humans but also crocodiles and cats were mummified. Ancient Greek historians record that the Persians sometimes mummified their kings and nobility in wax, though this practice has never been documented. It has, however, been documented that the ancient Greeks created death masks from wax. In China, preserved corpses have been recovered from submerged cypress coffins packed with medicinal herbs. Probably the best preserved Chinese mummy is Lady Dai from Mawangdui. Researchers were able to perform an autopsy on her body, which showed that she had died of a heart attack ca. 200 B.C.E. Although mummification existed in other cultures, eternal life was the main focus of all Ancient Egyptians, which meant preserving the body forever. Egyptian culture believed the body even after death the body was needed as home for a person's Ka, which without it would be condemned to eternal wandering in the afterlife. The earliest known "mummified" individual dates back to approximately 3300 B.C.E., although it is not an internationally renowned mummy, such as Rameses II or Seti I. This virtually unknown mummy is on display in the British Museum and has been given the nickname 'Ginger' because he has red hair. Ginger was buried in the hot desert sand, possibly with stones piled on top to prevent the corpse from being eaten by jackals. The hot, dry conditions desiccated and preserved the body. Ginger was buried with some pottery vessels, which would have held food and drink to sustain him on his journey to the other world. There are no written records of religion from that time, but it likely resembled the later religion to some extent. The desert conditions were a fact of life, thus some natural physical preservation would occur whether intentional or not. The earliest technique of deliberate mummification, as used ca. 3000 B.C.E., was minimal and not yet mastered. The organs were eventually removed (with the exception of the heart) and stored in canopic jars, allowing the body to be more well-preserved as it rested. Occasionally embalmers would break the bone behind the nose, and break the brain into small pieces in order that it could be pulled out through the nasal passage. The embalmers would then fill the skull with thick plant-based resin or plant resin sawdust. It also was not until the Middle Kingdom that embalmers used natural salts to remove moisture from the body. The salt-like substance natron dried out and preserved more flesh than bone. Once dried, mummies were ritualistically anointed with oils and perfumes. The Twenty-first Dynasty brought forth its most advanced skills in embalming and the mummification process reached its peak. The body's abdomen was opened and all organs, except for the heart, were removed and preserved in Canopic jars. The brain was pulled out through the nose with hooks, then discarded as useless. The emptied body was then covered in natron, to speed up the process of dehydration and prevent decomposition. Often finger and toe protectors were placed over the mummy's fingers and toes to prevent breakage. They were wrapped with strips of white linen that protected the body from being damaged. After that, it was wrapped in a sheet of canvas for further protection. Many sacred charms and amulets were placed in and around the mummy and the wrappings. This was meant to protect the mummy from harm and to give good luck to the Ka. Once preserved, the mummies were laid to rest in a sarcophagus inside a tomb, where it was believed that the mummy would rest eternally. In some cases the mummy's mouth would be opened in a ritual designed to symbolize breathing, giving rise to legends about revivified mummies. In the Middle Ages, thousands of Egyptian mummies preserved in bitumen were ground up and sold as medicine. The practice developed into a wide-scale business which flourished until the late sixteenth century. In the eighteenth century, mummies were still believed to have medicinal properties against bleeding, and were sold as pharmaceuticals in powdered form. Nineteenth-century aristocrats would occasionally entertain themselves by purchasing mummies, having them unwrapped, and holding observation sessions. These sessions destroyed hundreds of mummies, because the exposure to the air caused them to disintegrate. An urban myth of mummies being used as fuel for locomotives popularized by Mark Twain casts doubts on mummies supposedly being used as a source of fuel and paper, but the truth of the story remains a debate. Egyptian mummies became much sought-after by museums worldwide in the nineteenth and early twentieth centuries and many exhibit mummies today. Notably fine examples are exhibited at the Egyptian Museum in Cairo, at the Ägyptisches Museum in Berlin, and at the British Museum in London. The Egyptian city of Luxor is also home to a specialized Mummification Museum. 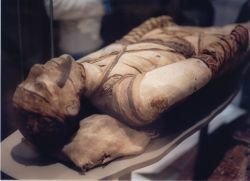 The mummified remains of Ramesses I were found displayed in a "Daredevil Museum" near Niagara Falls on the United States–Canada border. Records indicated that it had been sold to a Canadian in 1860 and exhibited alongside displays such as a two-headed calf for nearly 140 years, until a museum in Atlanta, Georgia, which had acquired the mummy along with other artifacts, determined it to be royal and returned it to Egypt's Supreme Council of Antiquities. 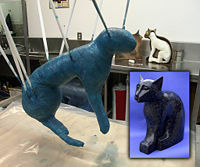 It is currently on display in the Luxor Museum. More recently, science has also taken interest in mummies. Bob Brier, an Egyptologist, was the first modern scientist to successfully recreate a mummy using the ancient Egyptian method. Mummies can be studied without unwrapping them using CT scan and X-ray machines to form a 3-D reconstructed digital image. They have been very useful to biologists and anthropologists, as they have provided a wealth of information about the health and life expectancy of ancient peoples. Scientists interested in cloning the DNA of mummies have recently reported findings of clonable DNA in an Egyptian mummy dating to circa 400 B.C.E. Although analysis of the hair of Ancient Egyptian mummies from the Late Middle Kingdom has revealed evidence of a stable diet. Ancient Egyptian mummies from circa 3200 B.C.E. show signs of severe anaemia and hemolitic disorders. Mummies that are formed as a result of naturally-occurring environmental conditions, such as extreme cold (Ötzi the Iceman, Ice Maiden), acid (Tollund Man) or desiccating dryness (Tarim mummies), have been found all over the world. More than a thousand Iron Age corpses, so called "bog bodies," have been found in bogs in northern Europe. These include the Gallagh Man, the Yde Girl and the Lindow Man. Natural mummification is fairly rare, requiring specific conditions to occur, but it has produced some of the oldest known mummies. The most famous ancient mummy is Ötzi the Iceman, frozen in a glacier in the Ötztal Alps around 3300 B.C.E. and found in 1991. An even older but less well-preserved unnamed mummy was found in Spirit Cave, Nevada in 1940 and carbon-dated to around 7400 B.C.E. The United Kingdom, the Republic of Ireland, Germany, the Netherlands, Sweden, and Denmark have all produced a number of bog bodies, mummies of people deposited in sphagnum bogs, apparently as a result of murder or ritual sacrifices. In such cases the acidity of the water, cold temperature, and lack of oxygen combined to tan the body's skin and soft tissues. The skeleton typically disintegrates over time. Such mummies are remarkably well-preserved, with skin and internal organs surviving; it is even possible to determine what their last meal was by examining their stomach contents. A number of mummies have been found in the Chehrabad Salt Mine in Iran. Some of the best-preserved mummies date from the Inca period in Peru some 500 years ago, where children were ritually sacrificed and placed on the summits of mountains in the Andes. Also found in this area are the Chinchorro mummies, which are among the oldest mummified bodies ever found. The cold, dry climate had the effect of desiccating the corpses and preserving them intact. Buddhist monks are said to have been able to prevent their bodies from postmortem corruption. In Japan, Sokushinbutsu (即身仏) were Buddhist monks or priests who allegedly caused their own deaths in a way that resulted in their being mummified. This practice reportedly took place almost exclusively in northern Japan around the Yamagata Prefecture. Between 16 and 24 such mummifications have been discovered. The monks whose bodies remain incorrupt without any traces of deliberate mummification are venerated by Buddhists who believe they successfully mortified their flesh to death. "Buddhists say that only the most advanced masters can fall into some particular condition before death and purify themselves so that his dead body could not decay." Bodies purported to be those of self-mummified monks are exhibited in several Japanese shrines, and it has been claimed that the monks, prior to their death, stuck to a sparse diet made up of salt, nuts, seeds, roots, pine bark, and urushi tea. Some of them were buried alive in a pine-wood box full of salt, as was the Siberian Buryat lama Dashi-Dorzho Itigilov whose body was retrieved in a perfect state of mummification in 2002. In the 1830s, Jeremy Bentham, the founder of utilitarianism, left instructions to be followed upon his death which led to the creation of a sort of modern-day mummy. He asked that his body be displayed to illustrate how the "horror at dissection originates in ignorance"; once so displayed and lectured about, he asked that his body parts be preserved, including his skeleton (minus his skull, for which he had other plans). It was to be dressed in the clothes he usually wore and "seated in a Chair usually occupied by me when living in the attitude in which I am sitting when engaged in thought." 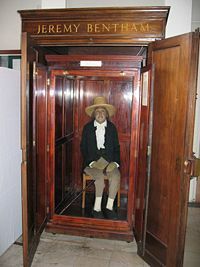 His body, outfitted with a wax head created because of problems preparing it as Bentham requested, is on open display in the University College London. During the early twentieth century the Russian movement of Cosmism, as represented by Nikolaj Fedorov, envisioned scientific resurrection of dead people. The idea was so popular that, after Lenin's death, Leonid Krasin and Alexander Bogdanov suggested to cryonically preserve his body and brain in order to revive him in the future. Necessary equipment was purchased abroad, but for a variety of reasons the plan was not realized. Instead his body was embalmed and placed on permanent exhibition in the Lenin Mausoleum in Moscow. The mausoleum itself was modeled by Aleksey Shchusev, based on the Pyramid of Djoser and the Tomb of Cyrus. 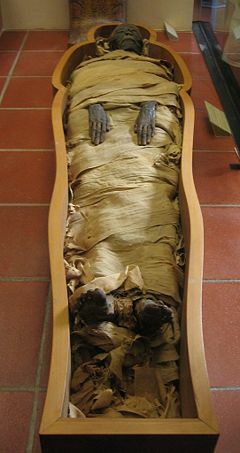 In the state of Guanajuato, Mexico, mummies were discovered in a cemetery northwest of Mexico City (near Léon). They are accidental modern mummies and were literally "dug up" between the years 1896 and 1958 when a local law required relatives of the deceased to pay a kind of grave tax. The Guanajuato mummies are on display in the Museo de las momias, high on a hill overlooking the city. Another notable example of natural mummification in modern times is Christian Friedrich von Kahlbutz (1651-1702), whose body is on exhibit in his native Kampehl. In 1994, 265 mummified bodies were found in the crypt of a Dominican church in Vác, Hungary from the 1729-1838 period. The discovery proved to be scientifically important, and by 2006 an exhibition was established in the Museum of Natural History in Budapest. In March 2006, the body of the Greek Orthodox Monk Vissarion Korkoliacos was found intact in his tomb, after 15 years in grave. The event has led to a dispute between those who believe the preservation to be a miracle and those who claimed the possibility of natural mummification. In 1975, an esoteric organization by the name of Summum introduced "Modern Mummification," a form of mummification that Summum claims uses modern techniques along with aspects of ancient methods. The service is available for spiritual reasons. Summum considers animals and people to have an essence that continues following the death of the body, and their mummification process is meant to preserve the body as a means to aid the essence as it transitions to a new destination. Summum calls this "transference," and the concept seems to correlate with ancient Egyptian reasons for mummification. Rather than using a dehydration process that is typical of ancient mummies, Summum uses a chemical process that is supposed to maintain the body's natural look. The process includes leaving the body submerged in a tank of preservation fluid for several months. Summum claims its process preserves the body so well that the DNA will remain intact far into the future, leaving open the possibility for cloning should science perfect the technique on humans. The technique was invented by Gunther von Hagens when working at the anatomical institute of the University of Heidelberg in 1978. Mummies are commonly featured in fantasy genres as an undead creature. During the twentieth century, horror films and other mass media popularized the notion of a curse associated with mummies. Films representing such a belief include the 1932 film The Mummy starring Boris Karloff as Imhotep. The belief in cursed mummies probably stems in part from the supposed curse on the tomb of Tutankhamun. The 1993 film The Mummy Lives, starring Tony Curtis with a screenplay by Nelson Gidding, was suggested by Edgar Allan Poe's story "Some Words with a Mummy" (1845). ↑ Arthur C. Aufderheide, The Scientific Study of Mummies (Cambridge University Press, 2003, ISBN 0521818265), 535. ↑ Salima Ikram, The Afterlife in Ancient Egypt, NOVA, January 3, 2006. Retrieved March 22, 2018. ↑ The Straight Dope, Do Egyptians burn mummies as fuel? Chicago Reader, Inc. Retrieved March 22, 2018. ↑ Clive Baldock and Stephen Hughes, 3-D reconstruction of an ancient Egyptian mummy using X-ray computer tomography Journal of the Royal Society of Medicine, 87(12) (1994): 806-808. Retrieved March 21, 2018. ↑ S. Paabo, Molecular cloning of Ancient Egyptian mummy DNA. from Nature 314(6012)(Apr 18-24, 1985): 644-645. Retrieved March 22, 2018. ↑ S.A. Macko, M.H. Engel, V. Andrusevich, G. Lubec, T.C. O'Connell, and R.E. Hedges, Documenting the diet in ancient human populations through stable isotope analysis of hair Philos Trans R Soc Lond B Biol Sci. 354(1379) (Jan 29 1999):65-75; discussion 75-6. Retrieved March 22, 2018. ↑ S. A. Macko, et al. Use of the amplification refractory mutation system (ARMS) in the study of HbS in predynastic Egyptian remains in Philos Trans R Soc Lond B Biol Sci. 354(1379) (Jan 29, 1999): 65-75; discussion 75-76. Retrieved March 22, 2018. ↑ PBS: NOVA Science Programming Bog Bodies of the Iron Age The Perfect Corpse. Retrieved March 22, 2018. ↑ Bruce Haig, Qilakitsoq - The Home of the Greenland Mummies Our Heritage. Retrieved March 22, 2018. ↑ Jens Peder Hart Hansen and Jørgen Meldgaard, The Greenland Mummies (McGill-Queen's University Press, 1991, ISBN 978-0773508705). ↑ Kelly Hearn, Ancient "Salt Cured" Man Found in Iranian Mine National Geographic News, July 3, 2007. Retrieved March 22, 2018. ↑ Self-mummification Buddha World. Retrieved March 22, 2018. ↑ Garth Haslam, Buddhist Mummies of Japan Onkiko goes to Japan. Retrieved March 22, 2018. ↑ John Gray, The Immortalization Commission (Farrar, Straus and Giroux, 2011, ISBN 978-0374175061). ↑ Jeremy Hsu, Lenin's Body Improves with Age Scientific American, April 22, 2015. Retrieved March 22, 2018. ↑ Pablo Gorondi, Hungary: 18th century mummies aid medical research Associated Press, August 12, 2012. Retrieved March 22, 2018. Egyptian Mummies from the Smithsonian Institution. This page was last modified on 30 October 2018, at 16:42.